Gifts from the Pirates: "Life's enchanted cup sparkles near the brim." Our kitchen cupboards seem to be packed with various drinking vessels for Opeie. Most of them to be fair should be disposed of. Some of them leak, some of them are a nightmare to clean and most of the others Opeie just doesn't like using them. The main problem in our house is the leaking. The cups cant be left for fear of them being spilled everywhere. We were recently sent a package from Nuby with various items to try out and there were a selection of cups/beakers for Opeie to test drive. Firstly and most importantly they are all none spill which is great and means that i can fill them up and leave them around the house for Opeie as he never stays in one place for very long. The prints are great on the patterned ones but when it comes to Opeie's drinking habits its all about the teats/spouts. While attempting to drink from one of the beakers with a wide spout we realised that opeie was really struggling and i had no idea why until Mrs M pointed out that he struggles because he tries to drink from them like he's breastfeeding. Now that it's been pointed out its really cute watching him curl his tongue around the spouts. Opeie's favourites of the beakers are the two with the silicone soft straws, they seem to be the easiest for him to use. Sometimes he sits there confused for a minute as some of them have straws all the way down to the base and some of them need tilting. Its entertaining to watch him looking so puzzled. perfect for out and about and leaving about the house. The beakers with the sports style caps didn't work out great for Opeie but were very handy for Seth's drinks at school. Seth likes them because they are colourful and stand out from all the children's cups which is great because so far they have made their way home from school every night. 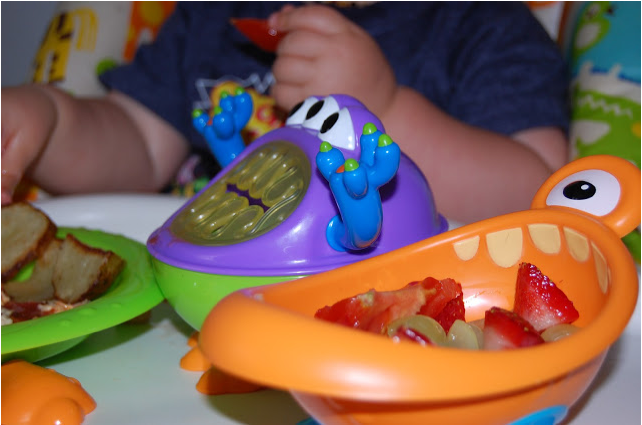 Although they were all great and Opeie loved trying them all out, his overall favourite is his monster no spill cup that i brought him from Asda a while back, which i love too because it goes with his other monster items and they look great.